These Blank Border Pages come 12 pages per package. 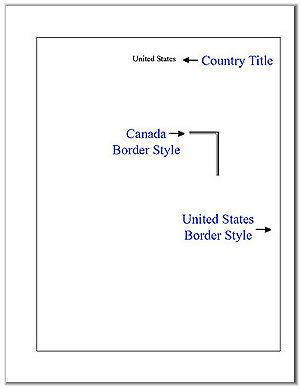 US Single Border Style or Canada Double Border Style. Country Title: You can request any Country title. When checking out, under comments, list your title that you would like to appear here. 65lb Bright White, Acid Free Paper. Measures 8 1/2" x 11". Order our Page Protectors as an Upgrade. With these Page Protectors you don't have to punch holes in your new SP Quad Pages. The Page Protectors are Heavy Gauge, Acid Free, High Capacity, And Never Lift Print. This set of Page Protectors are designed for one package of SP Blank Border Pages and contains 6 Page Protectors. If you want one Page Protector for each Quad Page, you must order Two (2) of these. Protects your Quad Pages and adds extra protection to your mounted stamps.